Whats this all about then? An Astro Warrior review straight out of nowhere? Why am I reviewing this now? Oh well, sorry if I'm confusing people here; let me begin again, this time at the beginning of the tale as I'm often told this generally helps! I have a very fond nostalgic connection with this game, for me it was the first Master System title that I ever set eyes on, I can still remember sneaking into the living room late at night on a cold mid-December evening in 1988 after being awakened by strange noises, the sound of laser blasts mainly. I walked straight into the living room where I found my dad sitting on the floor in front of the TV screen franticly pressing buttons on something. He explained to me that this was part of my Christmas present, but he would let me see it as long as I didn't mention this to my mother! I had a few goes, and didn't get very far, my hands were significantly smaller back then so I found it difficult to grasp the controller. After a few hours my dad put the system away until Christmas. I returned to bed now even more excited about the thought of Christmas day. The rest of that month went painfully slow, but when I did get my Master System on Christmas I absolutely loved it. 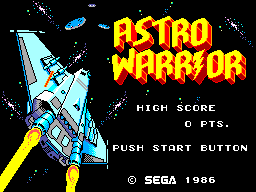 Astro warrior was the game I played most, because it was the simplest game I had for a beginner. The funny thing about this game is that after all this time I still whip out this game on occasion, it’s the perfect 10 minute blaster game, and this along with R-type helped me through my university years when I just couldn't read another word and needed a short break! The perfect escape! Some would accuse the game of being "just another top down scrolling shooter!" 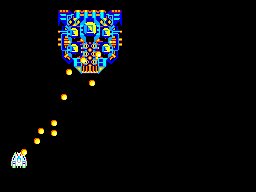 and they would be right in one aspect, it is a top down scrolling shooter, but it is a unique game. You begin in a somewhat crappy space ship, and have a single shot gun, but as you fly up over the "Imperial star destroyers" - (name given by me to the big grey ship thingies in background)you can shoot parts of the ship gaining you points, and when you get enough a small ship will fly down the centre of the screen, if you catch this your speed or weapon will be upgraded, you even get helper ships(or as I used to call them "pink pals"). Eventually you become quite powerful, but don't get too cocky, one single shot from any enemy will destroy you, taking you back to crapola ship! 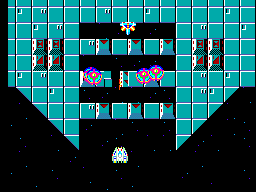 The weird thing about this game is it only really has three levels, there’s the "Galaxy zone", the "Asteroid zone" and the "Nebula zone" - all the levels look unique and are occupied by different enemies from the previous. But cool part of the game is the Boss characters such as "Zanoni". When you kill the boss characters you are treated to a message "Surely revive Zanoni" and you go to "light speed" to the next level. It's funny how something so simple can crack you up, for some reason I still find "Surely revive Zanoni" to be very funny, the "all your base belong are belong to us" may be the most widely known bad translation of something said in a game but I think people should be saying "surely revive Zanoni" more often - it's far cooler! Maybe we should start it off? Anyone want a "Surely revive Zanoni" T-shirt? Although it is true the graphics for the game are on the simple side, this does not matter, I have saw far worse graphics on the system, and Astro Warrior's are functional and still look decent, at least they were enough to impress all my friends back in '88 who all cursed their Commodore 64's after seeing this game in action. I like the weird combinations of colours in this game, each level has unique looking "baddies" and the bosses are HUGE! An important thing here for a shooter is unlike others on the system such as the god-awful "Xenon 2" Astro Warrior suffers from little to no slow-down. Some classy tunes are afoot from the moment the cart is inserted, each zone has its own music, the bosses have a theme and even the title screen has a catchy tune. These are the kind of tunes that stick in your head, you walk down the street unknowingly humming them to yourself not realising people are looking at you in a rather strange manner. Now, of the good things about Astro Warrior is its simplicity, no complex controls, no switching between weapons etc, although both buttons can be used, they both shoot, the D-pad control is very responsive, especially with a few power-ups. The only negative here I can see is that there is no auto-fire built into the game, unless you like to punish your finger you'll want to be using a rapid fire unit with this game. Now, as I said before, this game has stuck with me for all these years, this to me says something about the replay value of this game. It simply is the perfect five minute blast-a-thon, guaranteed to help in the relief of the stress of day-to-day life.